Documentation made easy with the RIDGID® micro CA-300 Inspection Camera, the next evolution of the microEXPLORER®. Easily record still images and videos of problems in hard-to-reach areas and save these on the internal memory (235 MB) or the included 4 GB SD-card. Comfortable pistol-grip design, large screen and rugged anodized aluminum camera head with four bright LEDs make it easy to detect and diagnose the unreachable. Get the perfect view with enhanced features like image rotation and digital zoom. Besides the replaceable 3.7V Li-Ion battery, the micro CA-300 can also be powered with the included AC Adapter which is ideal for time consuming (drain) inspection jobs or when you simply run out of battery. Display 3.5" color LCD (320 x 240 resolution). Camera Head 17 mm diameter, aluminum construction. Lighting 4 LEDs with adjustable brightness. Cable Reach 3' (90 cm) expandable to 30' (9 m) with optional extensions. Image/Video Format Still Image - JPEG (640 x 480). Video - MP4 (640 x 480 resolution). Video Output 3' (90 cm) RCA cable included (640 x 480 resolution). Waterproof Camera and cable to 10' (3 m) when properly assembled. Power Source 3.7V Li-Ion battery or 5V AC adapter. Image Rotation 4 x 90˚. SD-card Up to 32 GB (8 GB card included). Integrated audio recorder, speaker and headset. micro CA-300 Inspection Camera is rated 4.7 out of 5 by 18. Rated 4 out of 5 by Kees from Good, but promised resolutions options not available The manual noticed a choise in resolution, but this option for a higher (better or best) resolution up to 1600x1200 was not present in the menu. Rated 5 out of 5 by ajplumbing98 from Great equipment Best investment A&J Plumbing has done.Easy to use,clear monitor, better than the black and white monitor. Rated 5 out of 5 by JohnK from Works very well Works very well. Have bought several of these units. Rated 4 out of 5 by Alexy from This camera is everything it purports to be. Very pleased with this camera. This camera with all its features is worth every cent. The abilty to present an actual video of the problem area to the customer is invaluable. Rated 5 out of 5 by briand from Rugged, Easy to Use, Cost-effective The micro CA-300 was an occasional-use purchase for application when carrying out surveys / reporting on defective mechanical and electrical services installations in buildings (but NOT using the camera near live electrical conductors). I have previously hired much more sophisticated remote camera equipment for this task, but the micro CA-300 has proved a better balance between ruggedness, ease of use and cost. Rated 5 out of 5 by artsig from Wonderful surprise!!!!! I was very pleased with the quality of this camera. Its a big camera in a small camera body. Very clear image and the ability to use it in fixtures like toilets and others make it a great fit for plumbing service. 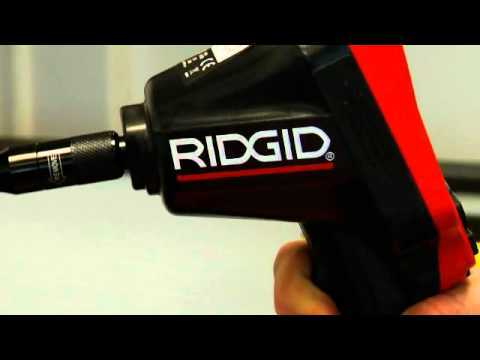 Rigid has scored another touchdown with this tool. Rated 4 out of 5 by InspectorTse from Not a bad product for the price. Only thing that is a concern is that the battery door assembly can break easily, but Ridgid was very good at replacing it. I just recently opened my new Micro CA-300 Inspection Camera and their is an ABC plumbing showing in its screen. How do I remove/change this info? The information is showing ABC Plumbing with phone number. I believe it is generic or part of the demo, but how do I remove or change it to my company's name and info? That sounds like it is paired up with one of the micro reels and that message is a function of the count plus on the reel. The message should go away if you press and release the T button on the center of the reel. Please feel free to give us a call at 800-519-3456 if it doesn't go away so we can troubleshoot with you over the phone. Thank you for being a Ridge Tool customer. We offer a 6 mm Imager with a 1 m Cable (catalog # 37098) and a 6 mm Imager with a 4 m cable (catalog # 37093) that will work with your CA-300. Why wont my pictures download to my ipad? I own both the micro explorer and now the ca-300. With the Mico explorer i am able to take the SD card and plug it into an adapter to download pictures into my ipad. With the ca-300 i am not able to do this same function. Any solutions? i am updated to v2.4 one the ca-300 which is the most up to date firmware. So far I have figured out that the iPad needs the pictures to be in a folder named DCIM and the ca-300 makes a folder named photos.